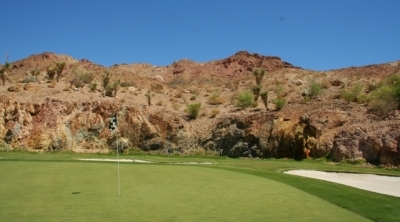 BOULDER CITY, NV – It may seem strange to name a golf course in the middle of a bone-dry desert after flowing water, but somehow, Cascata (near Las Vegas) fits the term nicely. Perhaps it’s because the term ‘Cascata’ is an Italian word meaning ‘waterfall’ (or cascading water, of course), but more so because the sometimes rapidly flowing streams on the property look like they’re a natural part of the landscape. The view from the 1st tee provides hints on what is to come at Cascata. Most people think of glittering neon lights and round-the-clock casinos when they ponder Las Vegas, but once you’re off the “Strip,” you’re in a beautiful western desert community with mountains close by. In other words, a mountain/desert layout would fit right in there. 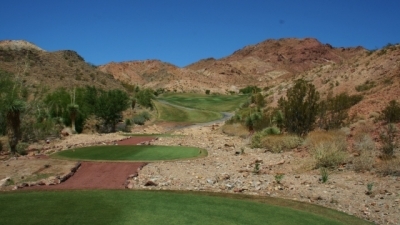 The course was originally built for MGM, but was then sold to Caesar’s (which was in turn bought by Harrah’s). 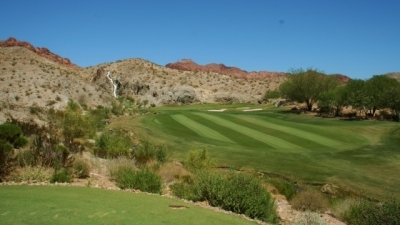 Regardless of owner, since opening in 2000, Cascata has rivaled the famous Fazio-designed Shadow Creek as a haven for high-stakes gamblers who just happen to enjoy a little golf… during the day. The par three 12th hole. And who says golf and gambling aren’t compatible? Jones said they did an extensive search for the right site for Cascata, eventually striking gold about a half hour south of the “Strip” in Boulder City. There, they discovered 440 acres of land up in the hills with ancient stream beds that just screamed “golf” from the start. The natural desert environment is never far away at Cascata. Here, looking behind the 2nd green. “It’s the 8th wonder of the golfing world as far as I’m concerned,” Jones added. 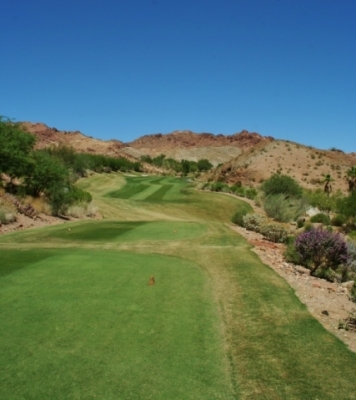 When building a golf course in the desert, most of the time you must create just about all the variation in the individual holes because the land is somewhat flat and featureless. The rocks and valleys at Cascata took care of that problem naturally. With very little flat ground at Cascata, most holes head uphill or downhill. Here, the short par four 11th hole. It’s true, there’s a mix of ‘oasis’ and isolation at Cascata, a piece of paradise perfectly suited for those seeking the full experience of Las Vegas. With a plethora of themed-casinos that range from Paris’s Eiffel Tower to Egypt’s pyramids, a lush landscape in the middle of rugged rocky desert doesn’t feel out of place at all. 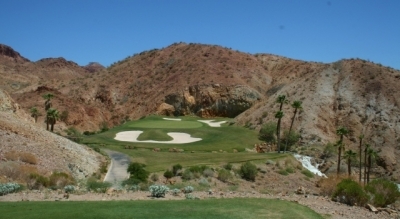 Because of its setting, Cascata is most definitely a desert course – but it’s hardly target golf. I don’t have statistics on the amount of turf, but the playing areas are exceedingly generous on many holes. No need to worry about a great many unanticipated treks through the desert here. Oddly enough, Cacata plays more like a mountain course than its flat desert cousins. Though most holes offer some change in elevation, the dramatic, downhill (par five) third hole is the most memorable. Standing on the tee, you can see for 50 miles – not exactly an experience that you’ll get everywhere. 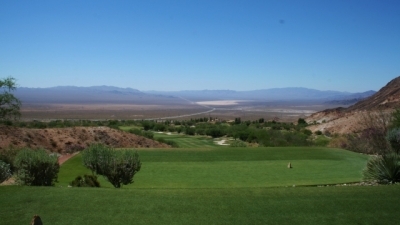 It seems like all of Nevada is below you on the tee of the par five 3rd hole. “At the same time, the course is very fair. There are no forced carries (from the forward sets of tees), no hidden trouble. Good players can shoot a very good score if they drive it in play,” Dutt explained. Rees Jones has earned a reputation for designing golf holes where the strategy is laid out before you from the tee. Cascata’s landscape certainly must have challenged him to pick lines where everyone can see where they’re shooting, but he’s done it. Rees Jones did a masterful job of fitting the holes around the natural features of the land at Cascata. It’s visually intimidating at times, but that doesn’t mean you can’t see it. One aspect of the Cascata experience that isn’t rugged is the playing conditions. We saw the course in August during the heart of the summer, yet everything was green and lush. 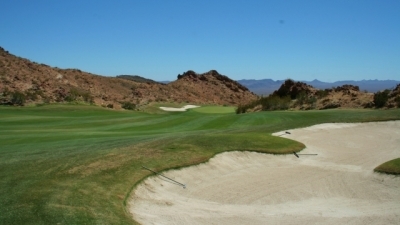 Fall and Spring are considered the high seasons in the desert (it can get surprisingly chilly in the winter, believe it or not), so it’s a tough task to keep the course in such great shape with wide swings in temperature. Because the course is so spread out, players who prefer to walk will be disappointed – at least until they hear that there are 8 ½ miles of cart paths. This may be a ‘desert links,’ but hoofing it here isn’t practical. Nothing is hidden at Cascata, but that does not mean there is a complete lack of visual intimidation. But the caddie program alleviates a lot of the worry in dealing with navigation and shot selection. Our caddy, Greg, was more than helpful in laying out every shot as well as performing the usual caddy functions of raking, cleaning clubs and reading putts. Greg was also terrific at tracking down the occasional wayward shot in the desert – which is perhaps the nicest thing about having a caddy. From behind the green of the challenging par four 14th hole. You see one of those systems immediately when you enter the clubhouse, as the waterfall that begins at the top of the slope of the driving range flows right through the building. A nice touch. The par three 7th hole is tucked into a canyon, and is one of the prettiest views on the course. 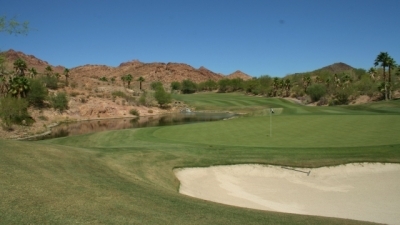 Dutt says there are nine water features total, a rarity for Las Vegas area courses. Hole highlights include the aforementioned par five third hole, with an elevated tee that must be experienced to be believed. We haven’t talked a lot about wind, but Jones says it can get pretty breezy at Cascata – and if you’re there on one of those days, hitting the fairway on this hole will be quite a feat. The par three seventh hole is definitely one you’ll remember, with a small mountainside as a backdrop. It only measures 157-yards, but there’s trouble all around the putting surface in the form of water and bunkers. The green looks like a small target as well… and then you’ll find out about the slope of the putt once you get there. Much tougher than it looks. The risk-reward par five 18th hole will leave you with a satisfied feeling at Cascata. On the inward nine, the par four fourteenth is a true gem – not only in looks, but in strategic challenge as well. A stream runs down the right side of the hole all the way to the green (which actually becomes a pond at the end) and there’s a little room down the left side to miss your tee shot. From the fairway, the hole doglegs right, putting a premium on accuracy for the approach. The closing par five 18th hole is a terrific risk-reward opportunity to close out the round. Long hitters may try to cut the dogleg left off the tee, which sets up a choice on whether to try for the green in two. Naturally, the closer you challenge the hazards, the easier the next shot. Cascata has won a number of awards from various publications for the quality of the golf course, service and many amenities, yet it’s the special touches that make it even that much better. For example, every guest receives a locker with his or her nameplate when you arrive at the clubhouse – and you’ll never feel like you’re hurried. “It’s unique – I’d say it’s one of a kind. And I don’t think, with the economic situation today that it will be repeated real soon,” Jones concluded. Cascata is the truly relaxing experience that Jones and the owners set out to provide – not to be missed on your next trip to Las Vegas. Reservations: (702) 294-2005, x: 1. Rates can vary from $250 in summer to $375 in prime time (fall / spring). 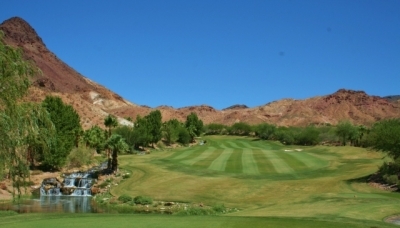 Cascata competes with Shadow Creek and Wynn Golf Club. The course is open to guests staying at ANY hotel in Las Vegas, not just Caesar’s Entertainment hotel properties. 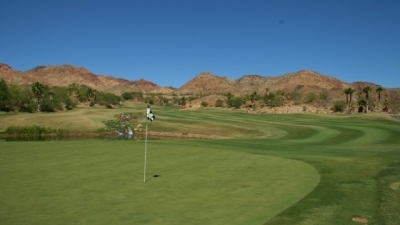 Guests can also play Cascata’s sister property Rio Secco, another Rees Jones design and home to the Butch Harmon School of Golf.